AFTER - Egg shells with paper confetti will biodegrade. Kids are tempted to spray in the face - have a rule sign! Having this carnival booth OUTSIDE is Necessary! 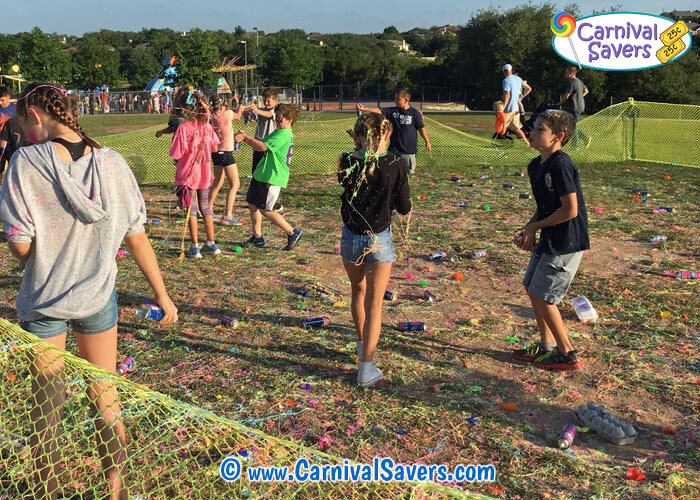 Weeks before your event, find a large, grassy area and take your time to walk carefully around the chosen spot to make sure the area does not have obstacles that someone could trip over, holes in the grass or poles a child could run into. The day of your event set out your barrier with the protection on top of the stakes and your table with the chosen items for sale. Kids love this booth and it can be a fantastic money maker for your school or fundraising carnival! We have seen some issues with the Fun Zone booth that we wanted to point out so you can discuss with your planning committee if this booth is right for your event. 1. Kids seem to want to spray the items on other kids faces. Well, it is not fun to get anything sprayed in your eyes - so we recommend requiring kids wear sunglasses and for volunteers to tell kids not to squirt in the face. 3. Party String is MESSY! Disappearing Ink is less messy- (but have your trash cans ready for the empty bottles.) 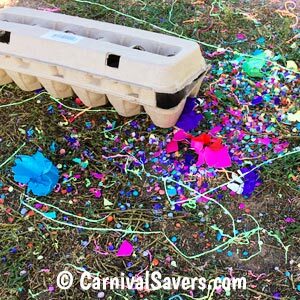 If you are looking for something that is a little friendlier for the environment, confetti eggs with non-metallic confetti will decompose and the egg shells will actually benefit the soil :) Click to see more information about confetti eggs here. Kids pay tickets to participate in the "Fun Zone". 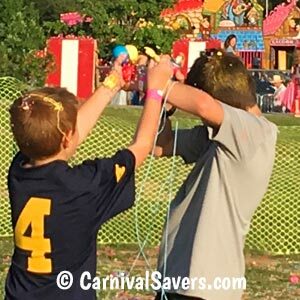 Generally they pay for the disappearing ink, confetti eggs, or party string which run fairly quickly, out and then the kids will want to pay more tickets to keep the fun going. If you have water squirts and water refill buckets, you may wish to let a certain amount of kids in the zone and time the kids for 5 - 7 or so minutes of chasing and refilling their squirts. One large elementary school (900 children) we have worked with for years purchases oodles of diapering ink and they sell out every year! They make about $2000+ in sales just from the ink sales as they are able to mark up the cost to be $1 per bottle. If this is your first year with the Fun Zone, you may wish to presage tickets just for the items and then order some extras for folks who buy the day of your event. If you have water squirts for sale, we do not recommend a gun shape. We only sell animal or soda bottle squirts just to keep it fun for all! See our some squirts below! FUNFAIR SUPPLIES for the FUN ZONE BOOTH!